And I’m (mostly) proud of it. I’m a nostalgic at heart. I have a hard time letting go of things. My wife would probably describe it as low-level hoarding. That may be true. Stashed throughout our apartment are an impressive array of retro sneakers, old hip-hop magazines, comic books, CDs, and stickers. It all harkens back to a simpler time—my youth. Earlier this year, I discovered that one of my favorite knick-knacks from yesteryear was celebrating a milestone birthday. According to my account info, my AOL.com email address gasped for its first breath of air on Sept. 24, 1994—the beginning of my senior year of high school and two days before my 16th birthday. Two decades later, it remains my primary means of email communication. You should see the reactions I get when I give someone my email address here in the 21st century. Most of the time it’s simple incredulity. Sometimes it’s laughter coupled with a “… no, seriously?” Then there’s always the follow-up query: “Don’t you have a Gmail account?” Yeah, I do. But I also have this AOL address that works perfectly fine. I swear, it does. As was the case with many people, America Online was my introduction to the Internet, in the early 1990s. Complementary installation CDs touting hours of free trial access were ubiquitous back then. They magically appeared in the mail. They were neatly displayed at the register at the drug store. Once you had that colorful, shrink-wrapped CD, all you needed was a working phone line, a modem, and a credit card. A few obnoxious clicks, beeps, and whirrs later, you were good to go. I kept my modem on top of a throw pillow to muffle the noise and not wake up the entire house during late hours—prime time for usage, because no one would call the house and interrupt the connection. Mine was a proud AOL family. At first, being online was a fairly limited experience; there were some message boards, some chat rooms, a few rudimentary games, and, of course, those quirky .WAV notifications. Most of my time was spent bouncing around chat rooms, discussing hip-hop, superheroes, video games, and living on Long Island. But as cyberspace began expanding at breakneck speed in the early to mid-‘90s, AOL rolled out features that offered gateways to life outside of its yellow mascot–guarded garden (most notably, Usenet access in September 1993). Shortly afterward, in 1994, your screen name was mashed together and given its all-important AOL.com suffix. And just like that, you officially had an email address where anyone in the world could drop you a line. It was amazing. Most of the time, I used email to initiate more personal conversations with friends I had made on the rec.music.hip-hop Usenet board (trading 90-minute Maxell cassettes via traditional mail soon followed), subscribing to email lists of forward-thinking event promoters and DJs (I enjoyed a party or two), and communicating with girls who had access to photo scanners. By the fall of 1995, America Online boasted 4 million subscribers. In 1998, a horribly sappy rom-com, You’ve Got Mail, centered on finding love through AOL email. No, I did not go see it. Soon, however, the lightning-fast growth of the Web left AOL in the dust. As broadband connections became more common, fewer and fewer people relied on the AOL portal to get them onto the Web; meanwhile, other companies stepped up and started offering email addresses for free, including Yahoo, Earthlink, and Hotmail. By around 2002 (maybe earlier, depending on whom you ask), an AOL email address was already an antique, marking its owner less as a sophisticated early-adopter than as someone clinging to an obsolete technology. But I wasn’t swayed by the new Web-based email services. The late ’90s and early ’00s coincided for me with the end of adolescence and the intimidating first years out in the real world. My email address was an early incubator of my social life. I wasn’t the chattiest kid in high school. I kept mostly to myself and focused on my schoolwork. I was the kid who packed his backpack with three classes worth of books so I didn’t have to stop at my locker in between each class. Ironically, crafting emails to people I didn’t really know all that well prepared me for real, in-person conversations with the people I did know. Plus my Blackplanet page—an early social media site geared toward young black Americans—was linked to my AOL address, and I was very active on it. Why in the world would a young, single, and ready-to-mingle gentleman want to abandon that? Having a functional email address known to all my friends and contacts was very valuable to me. I thought that if I got rid of it, it would be like starting from scratch. People don’t change their phone numbers for fun. Why should I change my email? Let’s be clear: I wasn’t using dial-up during the George W. Bush presidency. My modem was in a box in the garage with a bunch of 8-track tapes; the throw pillow was back on the couch where it belonged. But AOL.com, with its simple, clean Web interface was still my preferred method of email retrieval. Yes, I grabbed a Gmail account like everyone else, but it was just to say that I had one. When I wanted to communicate with friends and acquaintances, I wrote them from my AOL account. I still do. I am fully aware that my loyalty to my AOL account comes with a stigma attached. The address evokes a unique brand of digital prejudice. When people get an email from me, they wonder if I’m not equipped to handle the rigors of the present-day Internet. People think I’m a “suburban senior,” not a 30-something resident of the media capital of the world, or a Web designer with a robust social media presence. As it happens, I’ve always been fortunate enough to have a computer nearby, ever since I was a kid (the first being an Apple IIc in 1988). Digital literacy was important in my family. It was the wave of the future, and my parents knew it. But thanks to my AOL address, I have to prove to people that I’m not a Luddite. Sometimes I have to explain to people that I don’t actually use America Online to check my email. In certain professional and business contexts, like when I’m applying for a job or selling something on eBay, I rely on an email account from a more socially acceptable provider, lest I be judged by my account, not my character. That iconic prewelcome screen depicting the little yellow man in those three boxes documenting the progress of your connection clearly left an indelible mark in people’s brains. Periodically, I’ll have to actually show someone the mail.aol.com client to illustrate that I can check my email just like normal people. Yes, there are ads (and plenty of them), but there are ads on Gmail, too. The AOL spam filter is strong (sometimes too strong), the client works beautifully on mobile, and I can receive attachments as large as 25 MB (but please, don’t ever do that). And if I really want to get crazy, I can toggle my settings to say “you’ve got mail” when I log in. I have yet to get such an urge. Some people contend that an AOL address is actually something of a status symbol; as recently as 2011, some members of the media and political elite, like Tina Brown and David Axelrod, reportedly used AOL email accounts. I don’t really buy it. Sure, some powerful people from an older generation haven’t bothered to switch over, maybe because, like me, they’re used to the good old AOL interface. But no one’s ever treated me like an elite thought-leader when I reveal my AOL address. Am I holding out for some throwback craze, in which people are going to inundate AOL’s servers trying to get their hands on addresses that sport that quaint three-letter domain? Am I hoping to brag that I never let go of my original one? Highly unlikely and absolutely not. 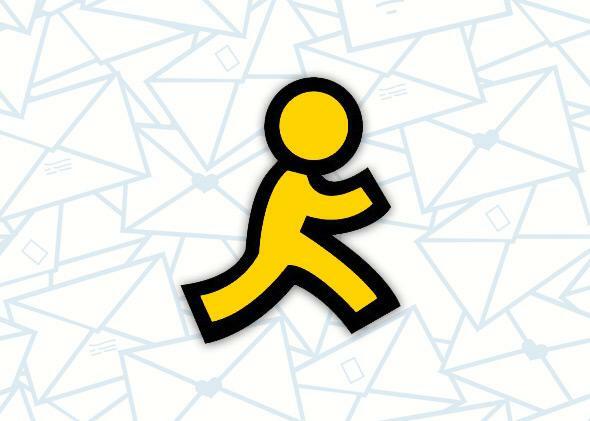 Is my commitment to my AOL address based on some subconscious loyalty to a brand that helped shape my teen and young adult years and carved the beginnings of a personal and professional path that I still walk today? Do I hold onto it for the same reason I hold onto my Air Huaraches and my seemingly endless back issues of The Source? Possibly. Shout out to Steve Case. But mostly I just haven’t switched because I haven’t needed to. My AOL account is still purring like a kitten.